The career potential for individuals with a Master's in Health Informatics is looking very good. Health informatics is the process of obtaining, storing, retrieving and using healthcare information to allow healthcare providers to collaborate on patient care and provide the best possible healthcare. It combines healthcare, communications and technology into the health system in an effort to provide patients with the best and most affordable healthcare possible while also making it cost-effective for the facility. Here are some career possibilities with a Master's in Health Informatics as well as potential wages. Health Informatics Specialists have many duties within an organization. They typically work with the company's leaders and managers on quality initiatives, directives and regulations to ensure the IT systems used to manage, collect and secure data are doing their job correctly for the organization. If a hospital CEO wants to reduce post-surgical infections or patient re-admissions, it is the responsibility of the informatics specialist to identify and test solutions while defining progress rates to the CEO. As of a May 2018, Health Informatics Specialists earned an average annual wage of $60,972, according to PayScale. Clinical informatics Liaisons collaborate with medical professionals and the IT department to create new applications, troubleshoot system issues and optimize the health informatics system. The Clinical Informatics Liaison also trains physicians and clinical staff on how to use various aspects of the health informatics system, including online physician portals, computerized physician order entry programs and electronic health records. They also monitor deficiency and compliance notices. According to Salary.com, Clinical Informatics Liaisons earned average annual wages of $84,318 as of April 2018. 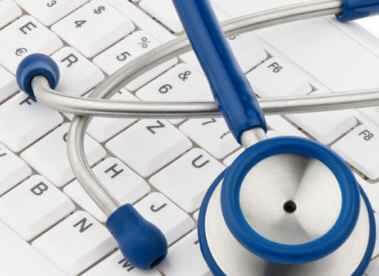 Another job possible with a Master's in Health Informatics is that of the Informatics Analyst. The Informatics Analyst collects data, analyzes it and works with the systems used for data management. They also educate other members of the healthcare on how to solve problems while developing concepts that can provide solutions to medical questions. They analyze various types of data, including insurance claims, study design, educational outcomes and patient readmission. When they're finished analyzing the data, they report their findings to other departments and to management. A popular form of this job is nurse informatics analyst, a position that earned an average annual salary of $77,774, according to a 2018 PayScale report. Informatics consultants with a master's degree in health informatics can find a wide range of job opportunities with consulting firms and health informatics software companies. Whether they're working virtually or onsite, their purpose is to help a company's informatics systems operate correctly by testing fixes, coordinating updates and troubleshooting errors. The individual must have expertise in information technology and clinical knowledge. This job can be very lucrative for the informatics consultant who travels to different sites. The average annual wage for informatics consultants is $80,514.00 as of May 2018. Healthcare occupations should see an employment growth of 18 percent from 2016-2026, according to a U.S. Bureau of Labor Statistics report. With all the talk of healthcare reform, health informatics is playing an important role in assisting professionals in their quest to improve the safety and quality of healthcare. Earning a Master's in Health Informatics prepares individuals for many in-demand jobs in the healthcare industry.